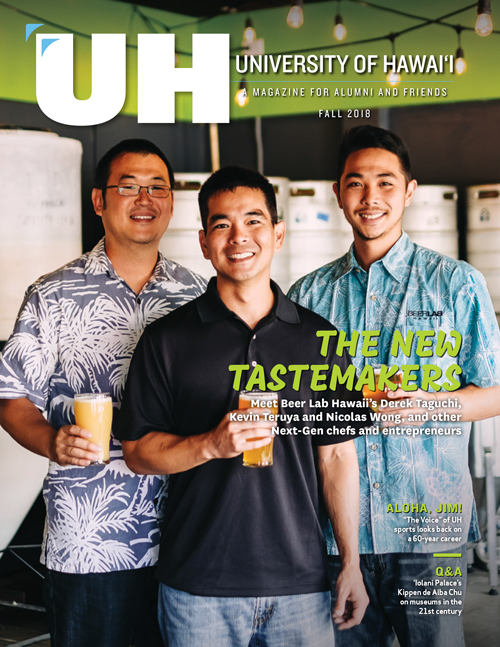 Flying all the way from New York as a young man, media executive Andrew Rosen discovered himself – and a new home – while studying at UH Hilo. Master of Public Health alum aims for collaboration and better public policy. At The Trust for Public Land, Laura Kaakua is helping to protect Hawai‘i’s cultural sites and native habitats. For Kapi‘olani CC alumnus Jason Tom, beatboxing is a way to uplift and encourage others. At Hawai‘i CC, Noah Dolim found a sense of community and passionate professors who sparked his interest in Hawaiian history. Osaka-born Tomoya Hori shares memories of life as a UH Hilo student and his go-to order at Ken's House of Pancakes. Therese Argoud shares her journey from working for a statewide regional perinatal health system to coordinating the Hawaii Keiki Information Service System. What started out as a line of natural soaps has transformed into a non-profit organization benefiting the local community. She journeyed to Mānoa from Italy to surf, swim, and pursue her master's degree. Now she's an environmental scientist and lead risk assessor. Since graduating with a MPH in 1987, Al Katz has worked to improve the health of Hawai‘i’s communities by being a Professor of Epidemiology at the UH Office of Public Health Studies. Jill Tamashiro has worked to improve the health of Hawai‘i by offering health education on the harm of secondhand smoke exposure. Sports doctor Jill Inouye, a former team physician for UH Mānoa athletics, says hard work goes a long way. Betty Wood knows that public health isn't just a career option, it's a way of thinking. Lorenn Walker journeys great distances to help people who've committed crimes to recognize their autonomy. Darin Pilialoha has a tough job as principal of Nānākuli High and Intermediate School–but there’s no place else he’d rather work.